On behalf of the entire LiDAR Services team, we would like to thank our valued customers for making 2012 an outstanding year and for making the outlook for 2013 even better. This year LiDAR Services has chosen to adopt a family for Christmas. With outside support and generous contributions by LiDAR Services staff we will be providing gifts, non-perishable food items and gift cards to a family of four. 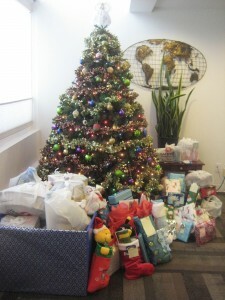 Thanks to everyone who supported our Christmas 2012 giving back to the community program. LiDAR Services, LLC completes Michigan and Wisconsin transmission line LiDAR survey on time and on budget. LiDAR Services, LLC will exhibit at the International LiDAR Mapping Forum, February 11 – 13, 2013, Denver, Colorado booth #26. For more information about the conference visit: http://www.lidarmap.org/ILMF.aspx. LiDAR Services, LLC has been awarded a new LiDAR contract for 600 miles of transmission lines located in Michigan and Wisconsin for thermal rating and vegetation analysis. LiDAR Services, LLC has a new office location at 8930 West Sunset Rd Suite 100 Las Vegas, NV 89148. LiDAR Services, LLC is pleased to announce that Roland Mangold has accepted the position of Sales and Marketing Coordinator for the US office as of September 1, 2012.